620 Important Information for our clients GENERAL BEFORE THE AUCTION During the preview you have the opportunity to examine and check the lots. You have the opportunity to examine and to check all lots for sales during the preview. BIDDING Numbers for bidding are handed out during the preview and auction. NEW CLIENTS We kindly ask new clients to legitimate before the auction. ABSENTEE BIDS If you cannot attend the auction personally, you may leave a written bid. Please use our form for written bids which is included in our catalogue. The amount noted on it is considered as maximum bid. The successful bid may also be lower. Written bids have to arrive at least 24 hours before the auction, written in our form and legally signed. BIDDING BY TELEPHONE is only possible for lots with a minimum estimate of Euro 1.000.- and if you accept to bid minimum the rate of the estimate. Please excuse that exceptions are not possible. Please use our form for telephone bids and send it at least 24 hours before the auction with a legally valid signature. The auctioneer is authorized to bid for the bidder up to the price printed in the catalogue if the telephone connection can not be established or is interrupted during bidding. BIDDING BY E-MAIL As absentee bids by Email are not signed, they require a written confirmation. Please fill in the bid form. 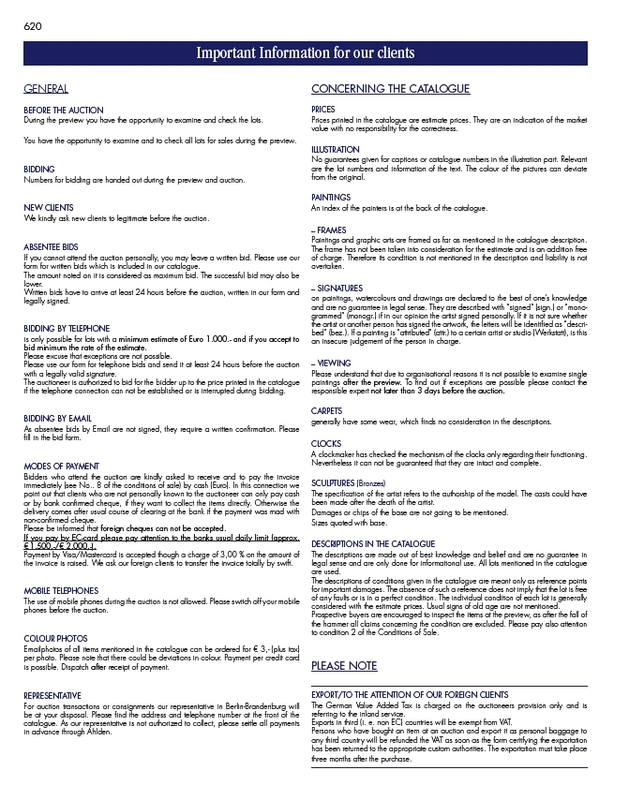 MODES OF PAYMENT Bidders who attend the auction are kindly asked to receive and to pay the invoice immediately (see No.. 8 of the conditions of sale) by cash (Euro). In this connection we point out that clients who are not personally known to the auctioneer can only pay cash or by bank confirmed cheque, if they want to collect the items directly. Otherwise the delivery comes after usual course of clearing at the bank if the payment was mad with non-confirmed cheque. Please be informed that foreign cheques can not be accepted. If you pay by EC-card please pay attention to the banks usual daily limit (approx. € 1.500,-/€ 2.000,-). Payment by Visa/Mastercard is accepted though a charge of 3,00 % on the amount of the invoice is raised. We ask our foreign clients to transfer the invoice totally by swift. MOBILE TELEPHONES The use of mobile phones during the auction is not allowed. Please switch off your mobile phones before the auction. COLOUR PHOTOS Emailphotos of all items mentioned in the catalogue can be ordered for € 3,- (plus tax) per photo. Please note that there could be deviations in colour. Payment per credit card is possible. Dispatch after receipt of payment. REPRESENTATIVE For auction transactions or consignments our representative in Berlin-Brandenburg will be at your disposal. Please find the address and telephone number at the front of the catalogue. As our representative is not authorized to collect, please settle all payments in advance through Ahlden. CONCERNING THE CATALOGUE PRICES Prices printed in the catalogue are estimate prices. They are an indication of the market value with no responsibility for the correctness. ILLUSTRATION No guarantees given for captions or catalogue numbers in the illustration part. Relevant are the lot numbers and information of the text. The colour of the pictures can deviate from the original. PAINTINGS An index of the painters is at the back of the catalogue. – FRAMES Paintings and graphic arts are framed as far as mentioned in the catalogue description. The frame has not been taken into consideration for the estimate and is an addition free of charge. Therefore its condition is not mentioned in the description and liability is not overtaken. – SIGNATURES on paintings, watercolours and drawings are declared to the best of one’s knowledge and are no guarantee in legal sense. They are described with “signed” (sign.) or “monogrammed” (monogr.) if in our opinion the artist signed personally. If it is not sure whether the artist or another person has signed the artwork, the letters will be identified as “described” (bez.). If a painting is “attributed” (attr.) to a certain artist or studio (Werkstatt), is this an insecure judgement of the person in charge. – VIEWING Please understand that due to organisational reasons it is not possible to examine single paintings after the preview. To find out if exceptions are possible please contact the responsible expert not later than 3 days before the auction. CARPETS generally have some wear, which finds no consideration in the descriptions. CLOCKS A clockmaker has checked the mechanism of the clocks only regarding their functioning. Nevertheless it can not be guaranteed that they are intact and complete. SCULPTURES (Bronzes) The specification of the artist refers to the authorship of the model. The casts could have been made after the death of the artist. Damages or chips of the base are not going to be mentioned. Sizes quoted with base. DESCRIPTIONS IN THE CATALOGUE The descriptions are made out of best knowledge and belief and are no guarantee in legal sense and are only done for informational use. All lots mentioned in the catalogue are used. The descriptions of conditions given in the catalogue are meant only as reference points for important damages. The absence of such a reference does not imply that the lot is free of any faults or is in a perfect condition. The individual condition of each lot is generally considered with the estimate prices. Usual signs of old age are not mentioned. Prospective buyers are encouraged to inspect the items at the preview, as after the fall of the hammer all claims concerning the condition are excluded. Please pay also attention to condition 2 of the Conditions of Sale. PLEASE NOTE EXPORT/TO THE ATTENTION OF OUR FOREIGN CLIENTS The German Value Added Tax is charged on the auctioneers provision only and is referring to the inland service. Exports in third (i. e. non EC) countries will be exempt from VAT. Persons who have bought an item at an auction and export it as personal baggage to any third country will be refunded the VAT as soon as the form certifying the exportation has been returned to the appropriate custom authorities. The exportation must take place three months after the purchase.